Asking cellists, conductors or orchestra managers which concerto they thought has become standard repertoire in recent years, the answer normally is „Dutilleux and Lutoslawski“. Yes, two outstanding concertos, inspired by Rostoprovich – almost half a century ago (ok, 45 years)! In the meantime maybe more cello concertos have been written than in the 250 years prior but I don’t want to believe that none of them was good enough to stick in the repertoire. Impossible, there must be some great ones, but most probably they have been forgotten because the next one was written a couple of weeks later and took attention away as it was the latest one…. I am not suggesting too many concertos are being written, but to get a new piece performed which has already been performed once is very hard. The easiest thing is to get the world premier, everybody wants to write it, play it, schedule it, listen to it, write about it. It’s like the world record in some track and field meeting; the runner is proud because he has done something nobody has achieved before him, the organizer is happy (and pays a fortune) as he can claim that at his event this world record was broken, the press is excited to write about it, and the audience is thrilled because they can brag about having been there. Yes, premiering a piece is an honor and a privilege but it also comes with a huge responsability as it is not another „world record“ but (at least for the composer) it is like a baby. A performer is not the parent, that is the composer, but a performer should not „just“ be the midwife who professionally helps to give birth to thousands of kids and forgets about them the next day (as meaningful as every single birth is for them), but we should be like a god-parent to the piece, watch over it not just for the birthdays but help it on their way to adulthood, at least until its 18th year and beyond, as the greatest pieces need to be kept in the minds of audiences, orchestras, other performers and the media. What to do? Well, first step would be instead of premiering a new piece every other year we soloists should rather do one in 5 years and put all our energy in promoting it – if it’s good. Which is the next question: how to make sure it’s good, and what is „good“? „Tout un monde lointain“ by Henri Dutilleux is „good“ because it is not only extremely well written but also a pleasure listening to and playing it while it doesn’t try to bow down to the lowest common denominator – and because it is so carefully crafted that the cello is always audible, maybe the biggest problem for contemporary composers: how to write a concerto for cello and big orchestra without covering the cello entirely. It must be so much fun to write for a big orchestra, all the colours, the special effects you can achieve – and in comes this lovely instrument, the cello, with its limited amount of overtones which makes it so hard to accompany as it gets easily lost in space. Many concertos might look good on paper but don’t work because in reality you can’t make an entire brass and wood wind section play so quiet that the cello will still be audible. After I had warned him when seeing the draft of his new concerto, that having three trombones and four trompets playing at the same time while I have lots of quick passage work on the g string might not be the best idea, the composer told me in his experience they will play softly enough as he had written „pianissimo“ in their parts. 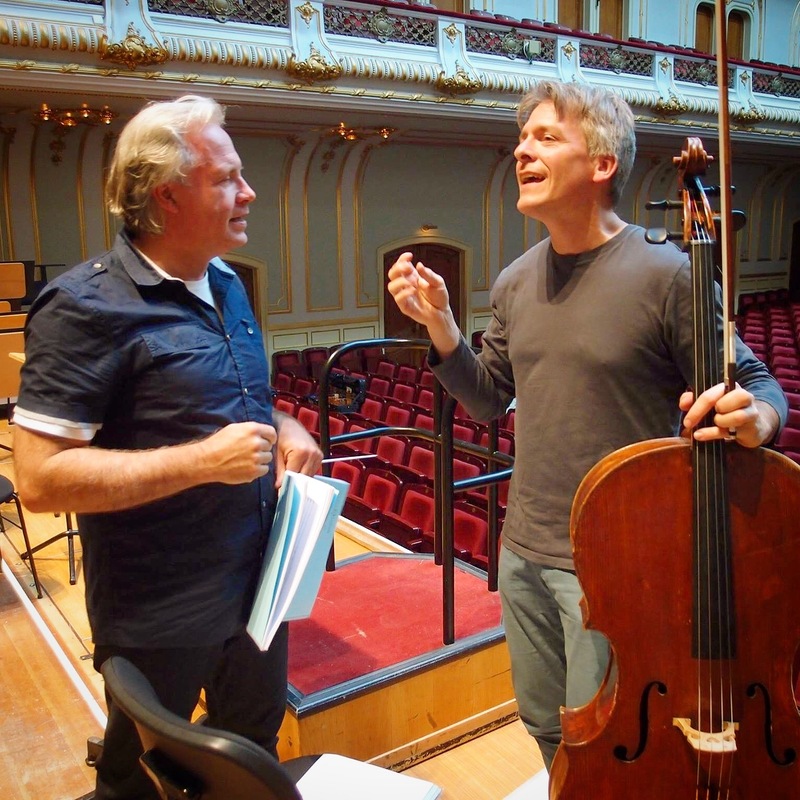 I told him his piece would only work with amplified cello which he refused – until the dress rehearsal after which he asked me if maybe we could revisit my idea of the amplification which by then was too late…. Another significant problem with contemporary pieces for cello arises when the instrument is not being treated as a cello anymore but as some kind of violin gone crazy – too many notes high up without taking into consideration that the cello is the instrument closest to the human voice and most of its appeal comes from that quality. If at the end neither performer (too difficult, too many notes) nor audience (cello sounds just hysterical) or orchestra (trying to tiptoe around the struggling soloist) enjoy the piece, we will just have to wait for the next world premier and hope for a success…. Luckily Unsuk Chin took in her concerto great care of balance, created a beautiful piece which audiences appreciate and which gives us performers (orchestra, conductor and cello protagonist) also the pleasure that it does make a difference if one plays the right notes at the right time – even lots of space for doing something personal and not just fighting for survivial. The performances in Hamburg mark the fourth time this piece has beein scheduled in the same country (Cologne, Munich, Berlin and Hamburg) – yet in any other country it has been performed not more than once. Leider bezieht sich Ihr Engegement nur auf unsere Werte und auch nur mit Worten (ok, Sie haben einige Flüchtlinge in Ihrer Wohnungn aufgenommen, das sollte berücksichtigt werden). Wie sieht es mit Umweltschutz aus? was mich jetzt mal interessieren würde: in einem anderen Post schreiben Sie, dass Sie nur für 1 Konzert nach Taiwan geflogen sind, um Unsuk Chins Cellokonzert dort aufzuführen. Gleichzeitig schreiben Sie, dass Ihr Cello immer einen Platz neben Ihnen im Flugzeug belegt. Ich habe über “Atmosfair” ausgerechnet, wie viel CO2 Sie und Ihr Cello dabei verursachen und wie viel Sie spenden müssten, um diesen CO2-Ausstoss zu neutralisieren. Das wären allein für dieses Konzert 302 Euro. bzw wie beruhigen Sie diesbezüglich Ihr Gewissen? oder ist Umweltschutz da nicht mit eingeschlossen? Ich wollte Sie auch keineswegs in irgendeiner Form angreifen. was ich eigentlich zu Ihrem Blog-Beitrag schreiben wollte, als Nicht-Musikerin- auch von der “Klassischen Moderne” werden eigentlich nur die Schostakowitsch Cellokonzerte gespielt (die sind zwar toll, aber langsam wird es etwas viel, sogar für die Konzertbesucher…). Ich habe vor einigen Wochen von Nikolai Miaskowski (ich hatte den Namen noch nie gehört) ein hoch interessantes Cellokonzert gehört, wunderbar gespielt von Ihrem Kollegen Truls Mork. und leider nur von CD kenne ich das Cellokonzert von Mieczyslaw Weinberg, das wird auch nie live gespielt. (nur Gidon Kremer und Andras Schiff nehmen sich jetzt der Musik Weinbergs an, vor 2 Wochen gab es das Klavierquintett von Weinberg, das hat mir sogar noch besser gefallen das das folgende Werk von Brahms). ich jedenfalls würde sofort kommen (und meine Familie sicher auch), wenn Sie eines der beiden Werke aufführen würden, sofern dies in Berlin geschieht.